In 2019 Mozambique suffered floods and destruction from the devasting cyclone Idai. ^ Walsh, Declan (20 April 2019). "Amid a Cyclone's Floods and Destruction, Mozambique Finds Shards of Hope". The New York Times. Retrieved 20 April 2019. ^ "Great Lakes Africa Energy | Our Projects". www.glaenergy.com. Retrieved 16 April 2019. ^ kig, Antony; a (2 February 2017). "GLA Energy to construct 250MW gas powered plant in Mozambique". Construction Review Online. Retrieved 16 April 2019. 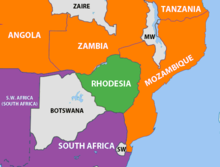 ^ "Will Mozambique end up like Nigeria or Norway?". 4 April 2013. Retrieved 16 April 2019. ^ Jian, Hong (2007). "莫桑比克华侨的历史与现状 (The History and Status Quo of Overseas Chinese in Mozambique)". West Asia and Africa. Chinese Academy of Social Sciences (5). ISSN 1002-7122. Archived from the original on 22 May 2012. ^ "UMC in Mozambique". moumethodist.org. July 2011. Archived from the original on 10 May 2015. 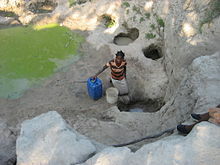 ^ a b Matsimbe, Zefanias (2009). "Ch. 9: Mozambique". In Denis Kadima and Susan Booysen (ed.). Compendium of Elections in Southern Africa 1989–2009: 20 Years of Multiparty Democracy. EISA, Johannesburg. pp. 319–321. Archived from the original on 28 February 2014. 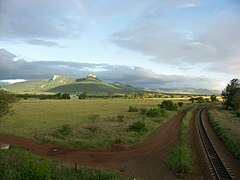 Modes of transport in Mozambique include rail, road, water, and air. There are rail links serving principal cities and connecting the country with Malawi, Zimbabwe and South Africa. There are over 30,000km of roads, but much of the network is unpaved. The Mozambique Defence Armed Forces or FADM are the national armed forces of Mozambique. They include the General Staff of the Armed Forces and three branches of service: Army, Air Force and Navy. 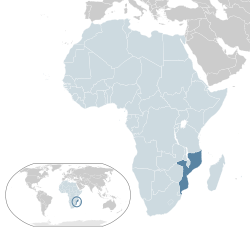 Portuguese Mozambique or Portuguese East Africa are the common terms by which Mozambique is designated when referring to the historic period when it was a Portuguese overseas territory. 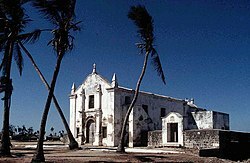 Portuguese Mozambique constituted a string of Portuguese colonies and later a single Portuguese overseas province along the south-east African coast, which now forms the Republic of Mozambique. Maputo, officially named Lourenço Marques until 1976, is the capital and most populous city of Mozambique. Located near the southern end of the country, it is positioned within 120 km of the Eswatini and South Africa borders. The city has a population of 1,101,170 distributed over a land area of 347 km2. The Maputo metropolitan area includes the neighbouring city of Matola, and has a total population of 2,717,437. Maputo is a port city, with an economy centered around commerce. It is also noted for its vibrant cultural scene and distinctive, eclectic architecture. Joaquim Alberto Chissano is a politician who served as the second President of Mozambique, from 1986 to 2005. He is credited with transforming the war-torn country of Mozambique into one of the most successful African democracies. After his presidency, Chissano became an elder statesman, envoy and diplomat for both his home country and the United Nations. Chissano also served as Chairperson of the African Union from 2003 to 2004. The Mozambique Liberation Front (FRELIMO), from the Portuguese Frente de Libertação de Moçambique is the dominant political party in Mozambique. Founded in 1962, FRELIMO began as a nationalist movement fighting for the independence of the Portuguese Overseas Province of Mozambique. 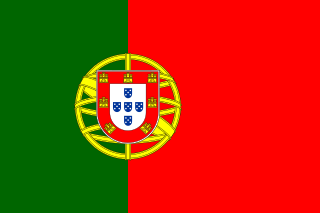 Independence was achieved in June 1975 after the Carnation Revolution in Lisbon the previous year. At the party's 3rd Congress in February 1977, it became an officially Marxist–Leninist political party. It identified as the Frelimo Party (Partido Frelimo). 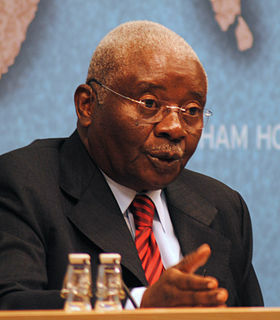 Armando Emílio Guebuza is a Mozambican politician who was President of Mozambique from 2005 to 2015. 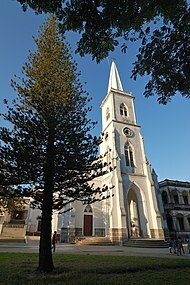 The Mozambican War of Independence was an armed conflict between the guerrilla forces of the Mozambique Liberation Front or FRELIMO, and Portugal. 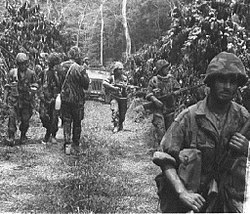 The war officially started on September 25, 1964, and ended with a ceasefire on September 8, 1974, resulting in a negotiated independence in 1975.